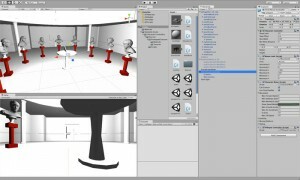 "RIVEEL 3D" (Realtime Immersive 3D Virtual Environments for Education and Learning) is a branch of the Cyprus Institute's digital cultural heritage research initiative. Georgios Artopoulos leads the effort to digitize historic locations, starting with critical sites in the city of Nicosia. The team’s ultimate goal is a methodology for acquiring, cataloging, viewing, and analysing archaeological data within a virtual environment, preserving excavation sites for the future. 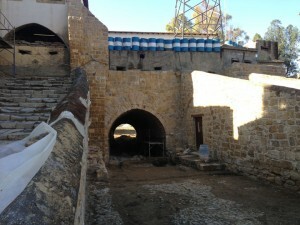 The Paphos Gate was originally built into Nicosia’s defensive bastion. While the site has undergone many renovations since the medieval period, it has always represented a border. Even now, it sits adjacent to the UN buffer zone, which divides Greek Cyprus and Turkish Cyprus. Because the Paphos Gate has radically transformed across multiple time periods, RIVEEL 3D will present users with alternative versions of the same location, revealing hidden layers of history and culture. Digital tools, authored by the AVL and AVL intern Colter Wehmeier, will help researchers design interactive environments built on real data and speculation from resident archeologists. Using an intuitive gesturebased interface, members of the public will explore these environments, and cultural researchers may utilize the app for further research and education. RIVEEL 3D will be exhibited in locations such as museums, schools, and tourist sites. Analysis carried out by the team will find use in future urban development across the city. This video demonstrates a prototype app made in concert with our RIVEEL3D research project (Real-time Immersive Environments for Education and Learning). Our goal is to make digital cultural heritage assets (text, images, video, models) accessible to the public using everyday smartphone technologies. Our app tracks the user's location in order to present relevant artifacts/media based on their proximity to tagged sites. Users are invited to consider the digital artifacts in relation to the environment as they explore. This experience synthesizes the immersion of physical space with the heightened presentation of a museum exhibit.